Scientists are learning more than ever about autumn bird migration, but there are still plenty of unsolved mysteries. What forces dictate their departures and arrivals? Why do they choose the routes they do? And why do some birds end up far off course? In the past, rare sightings have been chalked up as vagrants—anomalies of bird movement that couldn’t be predicted and might never happen again. But as time and data points have piled up, it’s become clear that many rare sightings are the result of regular, if infrequent, patterns. As we gain an understanding of these patterns, we can use them to unravel migration mysteries and know when and where to look for rarities. What’s that “peep” in the night? Ever go outside on a crisp September evening and hear what sounds like a spring peeper in the sky? Except, it’s fall… and frogs don’t fly? Lots of songbirds migrate at night and call to each other with very short, faint notes. The calls of Swainson’s Thrushes are among the most distinctive of these “night flight calls,” and they are loud enough that you can actually hear the birds as they fly overhead. Your best bets for hearing this peep in the night sky will come immediately after a cold front passes, particularly when birds fly into areas with poor visibility (like fog) and light pollution where calling increases dramatically (birds tend to call more frequently when disoriented). See this post to hear the call notes and learn how to identify them. Where did all those Northern Lapwings come from? After Hurricane Sandy in late October, 2012, dozens of Northern Lapwings showed up in the northeastern U.S. Never before had a tropical system’s passage brought such a bounty of this visitor from Eurasia. In fact, most hurricanes tend to take American birds and deposit them in Europe, not the other way around. But by analyzing meteorological data, the BirdCast team discovered that the hurricane’s counterclockwise circulation was augmented by high pressure over the North Atlantic and winds blowing from Europe. The result was east-to-west winds that delivered many American birders a new species for their life list. See the full story on vagrants from Sandy in the BirdCast archives. What drives cameo appearances of Fork-tailed Flycatchers in fall? 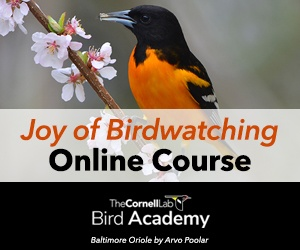 These spectacular birds are one of the species birders look forward to seeing when they plan a trip to Central or South America, where they are fairly common. But almost every autumn (especially in September) the tables turn and a few Fork-tailed Flycatchers come to visit birders in the eastern U.S. On closer examination, these rarities usually belong to the savana subspecies, which breeds from Brazil to Argentina and winters in Amazonia. In other words, these birds don’t belong in the U.S. The evidence suggests that when most Fork-tailed Flycatchers are migrating, some individual birds overshoot and wind up over the ocean, where they then fly downwind and end up making landfall in the U.S.
Orange and white colors show where Blackpoll Warblers migrate in the spring and then in the fall, en route to and from Canadian breeding grounds. The spring route covers much of the East, whereas in fall most birds leave from the Northeast and Mid-Atlantic, and fly directly to South America. See a larger map at eBird. Where did all the Blackpoll Warblers go? Blackpoll Warblers are fairly common spring migrants all the way up through the eastern states. Not so in fall, when they are rarely sighted in states south of the mid-Atlantic. That’s because their main fall migration route takes them out over the open ocean. The birds often fly nonstop over the Caribbean en route to their winter grounds in South America. Why do Chipping Sparrows migrate twice? 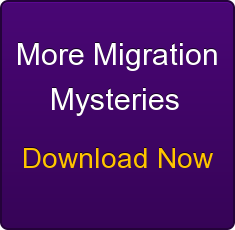 We often think of migration as a straight shot from breeding grounds to wintering grounds. But quite a few species—including the familiar Chipping Sparrow—take a detour to accommodate their molt. These so-called molt migrants take a short migration trip to one area where they grow new feathers. Then they resume their migration to wintering grounds. For instance, Chipping Sparrows in the Front Range of Colorado migrate eastward to molting sites such as the Pawnee National Grasslands, then continue to Mexico. What are Purple Gallinules doing in Newfoundland? When Purple Gallinules—which typically live in subtropical and tropical marshes—began showing up in Portugal, Maine, Newfoundland, Iceland, and Ireland, the BirdCast team took notice. They think an autumn drought in the Caribbean caused many gallinules to disperse in the winter of 2013–2014. Because Purple Gallinules are very strong fliers, and sensitive to changes in wetlands, they are very prone to wandering way out of their traditional range. And thanks to the now worldwide network of birders entering their sightings into eBird, the BirdCast team is able to convert these unusual sightings into data. What’s a Blue-footed Booby doing in California? The Golden State boasts a huge collection of cool birds, but the Blue-footed Booby is not usually one of them. It’s a tropical seabird typically found along the Mexican coast and south to South America—but in fall of 2013, many dozens of Blue-footed Boobies were reported along the California coast. When the BirdCast team looked into meteorological patterns, it appeared that unusually warm sea surface temperatures may have caused the move, along with a similar pattern in Elegant Terns. The suggestion is that prey fish moved north to find cooler waters, and so the boobies moved with them. Why do Long-billed Curlews winter in both California and Mexico? Long-billed Curlews breed in grasslands and open country of the central and western U.S. In winter, you can find them in coastal and interior California, as well as in landlocked wetlands of the Southwest and Mexico. By putting together species distribution models from eBird data, it appears these two populations may employ different migration routes. Curlews from the Great Basin may travel westward to winter in California, while Great Plains curlews travel south to reach Mexico.